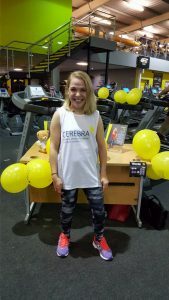 One of our Ambassadors, Cara Readle, recently completed a duathlon and raised over £500 for Cerebra! This was a particular challenge for Cara as she was born with Cerebral Palsy, but she has never let anything stand in her way! Cara’s duathlon saw her embarking on a 5km walk on a treadmill and a 5km cycle on a static bike. Initially the challenge was set to take place over the course of a day at Xcercise4less gym in Swansea but Cara did a fantastic job and managed to complete the entire challenge in just a couple of hours! To date, Cara has raised over £500 and you can still donate through her Just Giving Page.